The self for Kant is something real, and yet is neither appearance nor thing in itself, but rather has some third status. Appearances for Kant arise in space and time where these are respectively forms of outer and inner attending (intuition). Melnick explains the "third status" by identifying the self with intellectual action that does not arise in the progression of attending (and so is not appearance), but accompanies and unifies inner attending. As so accompanying, it progresses with that attending and is therefore temporal--not a thing in itself. 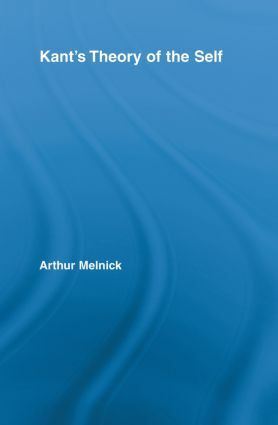 According to Melnick, the distinction between the self or the subject and its thoughts is a distinction wholly within intellectual action; only such a non-entitative view of the self is consistent with Kant’s transcendental idealism. As Melnick demonstrates in this volume, this conception of the self clarifies all of Kant’s main discussions of this issue in the Transcendental Deduction and the Paralogisms of Pure Reason.